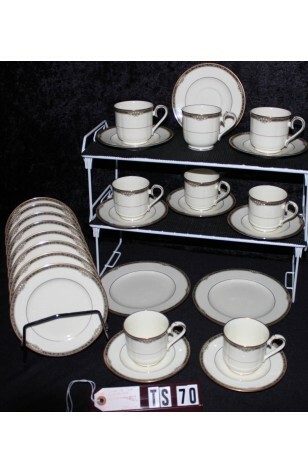 Noritake China Tea Set, 29-Pieces, Service for (8) plus extra pieces in the "Covina" Pattern #9791, Made from 1990-2002. A Beautiful Noritake China Tea Set for Eight in the "Covina" Pattern #9791. It is a Bone Color China with a Rope Border, Sets of Green Dots on the Border.. 22kt Gold Verges and Rims. Trim on the Border seems to be Hand Painted. A Lovely Set that could also be used with Regular China. Good Resale Condition unless noted below or in pictures.